Experienced fishermen know that controlling speed and monitoring surface water temperature is the key to catching various species of game fish. Controlling these critical parameters will result in a larger catch ratio. In early spring surface temperatures are especially critical, before the lakes stabilize and the thermocline develops. Our models include the revolutionary Sub-Troll 900 for speed and temp at the lure, the Osprey, Kingfish and Tournament Kingfish models of Surface Trolling Instruments. 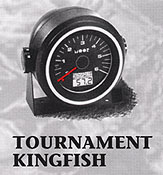 Moor trolling instruments provide the most accurate and easy to read display of trolling speed available. 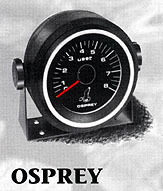 Speeds are easily read at glance, thanks to large 4-inch dials with highly visible needle indicators. A full 250 degree scale and unmatched sensitivity allow speed changes of less than 1/8 MPH to be easily detached even at a distance. Readings are in direct relationship to the speed of the boat, and thus the action of the lures. This eliminates the guesswork involved in using GPS or engine RPM as an indication of speed. 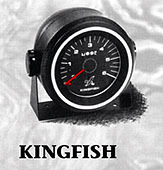 All models feature precision dampened movements which eliminates the bothersome fluctuations typical of other speed indicators, such as those small difficult to see digital readouts often included in fish finders. All this adds up to a rock steady speed indicators which allows the helmsman to anticipate falling and escalating speed caused by wind or wave, and make the necessary adjustments to consistently find and maintain the most productive trolling speed. Models with temperature provide a clear LCD display showing water temperature with 1/10-degree resolution. A sensitive sensor built into the sending unit provides rapid indication of temperature changes as they happen. If you're serious about catching fish you need to equip yourself with the best tools available. When it comes to controlling speed and monitoring temperature the choice is clear. Designed strictly for trolling Moor Electronics Instruments provide accuracy and performance not found in any other product. Our many year of experience making quality instruments, along with our commitment to service has made us the leader in this field. All trolling models include Surface Mounting Pod or may be Flush Panel Mounted.